The install.wim file (Windows Image File) is a compressed file which contains a set of many files and associated file system metadata and is included in any Windows installation Media under the "sources" folder (sources\install.wim). Sometimes when Windows 10 or 8 crashes, due to corrupted system files or for any other reason, there is a need to repair the Windows file system, by using the install.wim file, as the repair source. But, an install.wim file may contain several install.wim files (each one for different Windows 10 Edition e.g. Pro, Home, etc. ), which are referenced either by their numerical index or by their unique name. For that reason there is the need to extract the install.wim and get a valid (according to the installed Windows Edition), install.wim file, in order to repair Windows 10 or Windows 8. (e.g. by using DISM). 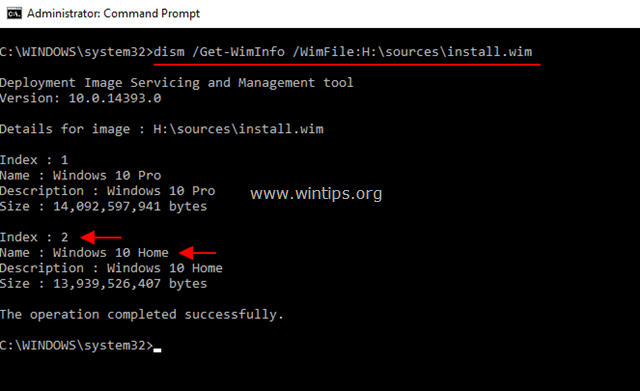 In this tutorial you 'll find detailed instructions on how to extract an install.wim file, that contains install.wim files for different Windows 10 (or Windows 8) Editions (e.g. Windows 10 Pro, Windows 10 Home, Windows 10 Education, etc.). How to extract an install.wim file that contains more than one install.wim files. 1. Attach or mount* the Windows installation media on your system. * e.g. : If you have installed the Windows 10 Home edition on your system, then the Index number is "2". * Note: Replace the IndexNumber according to your Windows 10 installed version or the Windows version that your want to extract from the source INSTALL.WIM file. 7. When the process is completed you should have a valid Windows 10 Home install.wim on the drive C: (C:\install.wim). I downloaded the .ISO from the Windows ISO Downloader Tool and it came with 'install.wim' already in the Sources folder. Using the CMD prompt above it placed the (Index 6) W10 Pro in my root directory. If I am correct now… going forward.. all I have to do is point the DISM command to that folder in order (if needed) to repair the OS by using that command. Am I right in my thinking? So far so good. I made an 'install.wim' file from my running windows 10 on another drive, managed to follow these steps above. But, unfortunately last monday, when Windows 10 was apgragine, my pc was cut off from the power. Now it is not possible to get into Windows at all. Simply extract the 'install.win' to the Windows drive (C:/)? Where should I put this 'wim' file? Which DISM commands are needed to extract it to the 'C drive'? Does it override all files? Or is there another option to get rid of this broken install warning? @Harry Betlem: Have you tried to perform a system restore? Try the instructions from this article. when i write this. dism /Get-WimInfo /WimFile:X:\sources\install.wim i get Access is denied. @tvätten: Sometimes the Antivirus program causes the "Access Denied" error in DISM. Worked prefectly on Windows 10 1803 disk, many thanks for the clear and plain language so much easier to follow then other blogs. I got Error 87 when trying this on a Windows 2018 Server ISO. "The export-image option is unknown"
@Scott: In which operating system do you use this command? you need Windows 10 at least. For those who have the new Windows 10 installer, it has changed slightly. No file chasing or long version location, copy paste install.wim back to where you wanted it and your done. This worked great and saved me a ton of research. Thank you.